Are you looking to do something great and exciting this year during the Halloween Holidays? 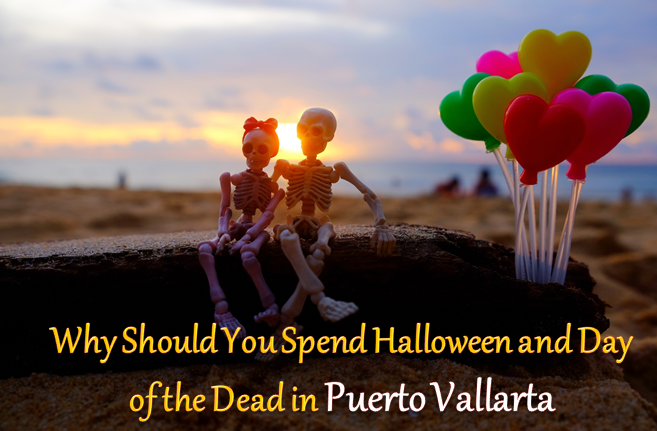 If you are, then Puerto Vallarta is the place to be to celebrate Halloween and Day of the Dead. Woww!! Two-holiday celebrations combined into one! Puerto Vallarta Yachts is all set to host and make the celebrations memorable for your guests on October 31, 2017. Halloween and the Day of the Dead are celebrated across the world, and they make for a perfect reason to spend your holiday in Vallarta. SCUBA DIVING – Puerto Vallarta is the main diving destination on the Pacific Coast of Mexico. Half of the dive sites are within the Banderas Bay while the other half surrounds offshore islands such as Los Arcos and the Marietas Islands. Here you can look for greatest underwater treasures such as coral, bottlenose dolphins, humpback whales, manta & eagle rays, massive marlin, tuna, sea turtles, underwater caves and rock formations, and of course, tons of tropical fish. Advanced divers looking for a challenge can travel to the offshore islands where currents are heavier. SUNSET CRUISE – Halloween is that time of the year when children and adults get dressed up in scary or funny costumes and have a gala time. Adore your funny dresses and set sail on the turquoise blue waters as the sun sinks into the horizon. Relax or take in the mesmerizing views of the wind in your hair and a drink in hand, while the sky around you is exploding in color. You can give your sail a whirl by joining the crew in hoisting the sails or take the helm. Have your camera ready to capture not only the dramatic sunset but the dolphins that might turn up to greet you. JET SKI SAFARI & SNORKEL – It’s time to drive your own Jet Ski, Wave Runner or Sea-Doo along the beautiful jungle-draped coastline of Puerto Vallarta. You can also relax lazily on the beach and spend time resting or taking in the spectacular views of the lush green scenery around. You will zip on your Jet Skis, doing some sightseeing and taking lots of great photos along the way. You will pass landmarks like the Puerto Vallarta hotel zone, the famous Malecon, the awesome villas of Conchas Chinas, Los Muertos Beach and the Los Arcos marine park. FUN ACTIVITIES – Last evening, you had a toast with the sunset with a glass of bubbly, today be part of some activities. Lie back on our cushioned deck and gaze at the stars as they appear one by one. The crew will host some games and fun-filled activities to make your evening a special one. Later you can tap your feet to the tunes of music played by a professional DJ. Once you are done with dancing and playing, treat your taste buds with scrumptious Mexican cuisine and desserts. As you will sail, you will pass through the night skyline of Vallarta. November 2 – a special time in Mexico is known as the Day of the Dead. The people get together to celebrate this special day with lots of enthusiasm and gaiety to honor those, who they love, have passed away. Come down into the streets of Vallarta and see how locals have created beautiful commemorative altars in the memory of those who have passed. The key highlight amongst all the decoration is sugar skulls and pan de muerto featured on the altars. Likewise in Halloween celebrations, candies are important part of Mexico’s the Day of the Dead celebration too. Mexico is obsessed with the sweet tooth! Later return back to your private boat charter in Puerto Vallarta to be part of more celebrations and activities. You can also pamper yourself with a rejuvenating spa. Don’t be scared, join in the fun and have a memorable holiday escapade on this upcoming Halloween! Lock in your reservations with us today!